The pineapple is a symbol of hospitality. 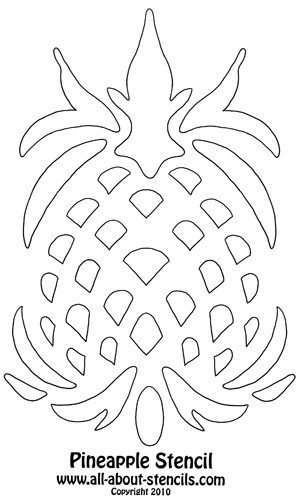 Here is a free pineapple stencil for you to craft into your home decor and welcome all who come! Just right click on the stencil and select print or save if you're on a PC or drag it into a document if you're on a MAC. The pineapple has served as both a food and a symbol of hospitality throughout the history of the Americas. The image of the pineapple has come to express the sense of welcome, good cheer, human warmth and family affection inherent to gracious home gatherings. Below is a video about stenciling on floors. You might consider using this stencil on your flooring so check it out! I designed this pineapple stencil for you! Throughout this web site you will find many Free Stencils from a large variety of styles. It is my intention to get you motivated to create art with stencils! It is hardly surprising that this symbol of friendship and hospitality also became a favorite of architects, artisans and craftsmen throughout the American Colonies. The hospitality of a mansion was displayed with carved wood or molded mortar pineapples on its main gate posts. It's easy for anyone to put custom hand painted images like this pineapple stencil on walls or where ever it is desired with the use of Stencil Designs. The first encounter between a European and a pineapple occurred in November, 1493, when Christopher Columbus, lowered anchor in a cove off the lush, volcanic island of Guadaloupe and went ashore. There, amidst parrot-flecked jungle foliage and wooden pillars spiraled with serpent carvings, his crew came upon piles of freshly gathered vegetables and fruits, including pineapples. I hope you find a place for this pineapple in your home and enjoy the pleasure it brings to you and your guests! Please take the time to view some of out other Stenciling Ideas and projects. P.S. If you're looking for Stencils (like these), that you can open at your computer and print now or save (No waiting on the Mail Man), just check out our Stencils Catalog for your next project. Here's a video about Stenciling Floors. You may find a few ideas about how the pineapple stencil can decorate wood or concrete. Enjoy! Return to Home Page from Pineapple Stencil. Return to Free Stencils from Pineapple Stencil.